This is the correct spelling of Tesla`s name in cyrilic. 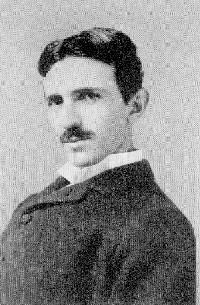 Teslas best-known invention takes the spark-gap oscillator and uses it to vibrate vigorously a coil consisting of few turns of heavy conductor. Inside of this primary coil sits another secondary coil with hundreds of turns of slender wire. 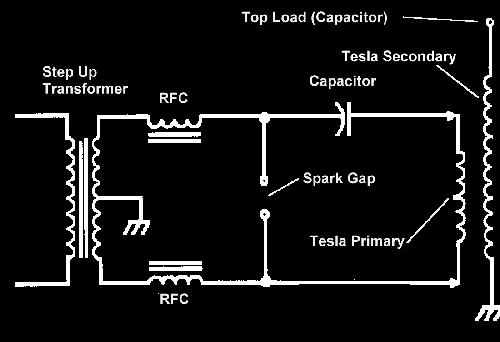 In the Tesla coil there is no iron core as in the conventional step-up transformer, and this air-core transformer differs radically in other ways. HOW A Tesla Coil WORKS A Tesla-coil secondary has its own particular electrical character determined in part by the length of that slender coiled wire. Like a guitar string of a particular length, it wants to vibrate at a particular frequency. The secondary is inductively plucked by the primary coil. The primary circuit consists of a pulsating high-voltage source (a generator or conventional step-up transformer), a capacitor, a spark gap, and the primary coil itself. This circuit must be designed so that it vibrates at a frequency compatible with the frequency at which the secondary wants to vibrate.